or Bokkems is whole, salted and dried mullet (more specifically the Southern mullet, Liza richardsonii, a type of fish commonly known in the Western Cape of South Africa as “harders”,and is a well-known delicacy from the West Coast region of South Africa. 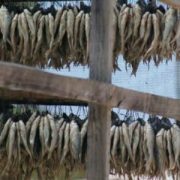 This salted fish is dried in the sun and wind and is eaten after peeling off the skin. In some cases it is also smoked. It is sometimes referred to as “fish biltong”. The word bokkoms comes from the Dutch word bokkem, which is a variant of the word bokking (or buckinc in Middle Dutch). The word bokking is derived from the word bok (the Dutch word for buck or goat), and refers to the fact that bokkoms reminds of goat, because bokkoms has the same shape as the horns of a goat, it is just as hard as a goat’s horns, and it stinks just as much as the horn of a goat (goats have scent glands behind their horns which causes the smell). of the use of the word in the Afrikaans language of South Africa was in the Patriotwoordeboek in 1902 in the form bokkom. As early as 1658, only six years after the first permanent settlement of Europeans at the Cape of Good Hope, four free burghers were given permission to settle in Saldanha Bay on the West Coast of Southern Africa. 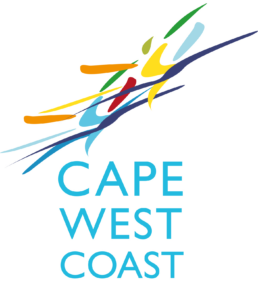 They were given the right from the Dutch East Indian Company to fish the waters of Saldanha Bay and send their catches to the Company’s trading post at the Cape of Good Hope to be sold to other burghers as well as to passing ships in Table Bay.